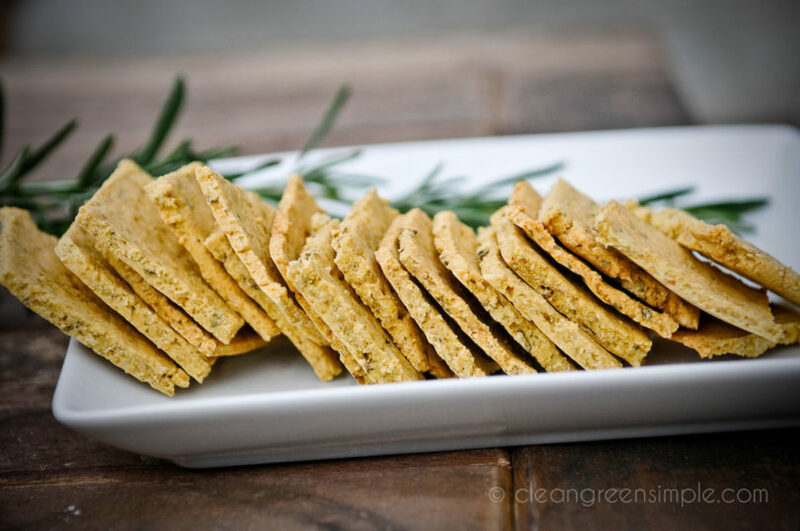 Hearty gluten free, vegan rosemary crackers, perfect for dipping and they make a great portable snack. Crackers are one of those things I know how to make, and I know are easy to make, but I always end up buying instead. But this weekend I decided to stop being lazy and make a batch, and they turned out delicious! These babies are gluten free and of course vegan, and they make a great portable snack. 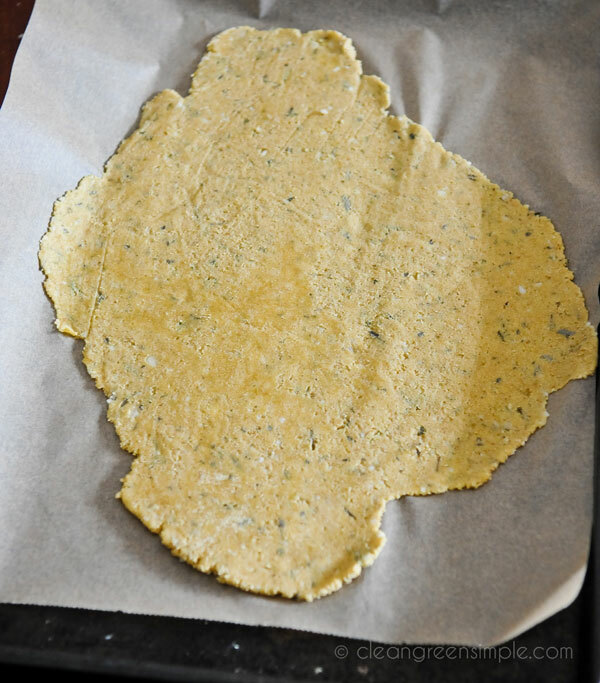 Just blend together some chickpea flour, some ground flax, baking soda, a bit of olive oil, and some dried herbs and you’ll have a nice ball of dough. Sandwich it between two sheets of parchment paper and roll it out (make sure it will still fit on a cookie sheet). Using a knife or a pizza cutter, cut it into 1″x1″ (or so) squares – you can of course be all tidy about it, but I like to just roll it out and cut them however and then add “rustic” to the recipe title. Much easier! Poke a few holes in each cracker with a fork so they don’t puff up in the oven. Then pop it in the oven at 350 for about 15-20 minutes or so, or until they are just starting to brown around the edges. Snap them apart and lay them out on a plate. 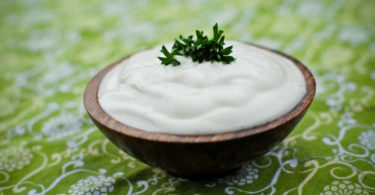 Serve with hummus, mock salmon pate, garlic dip, or anything you like. Combine all ingredients in a large bowl and mix until a dough forms. 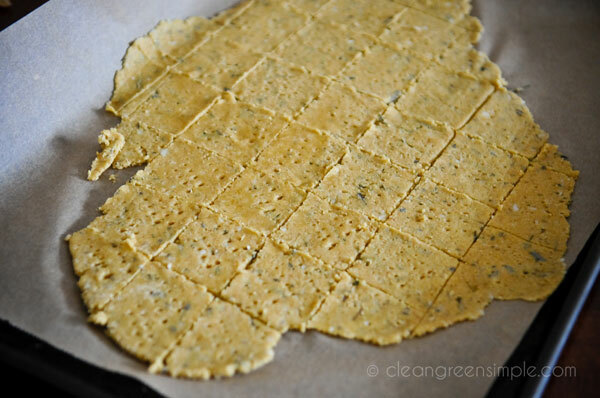 Add a bit more water or chickpea flour as needed to get a workable dough. Sandwich the dough between two sheets of parchment paper and roll out – try to get them as thin as possible, about 1/8-1/4 inch thick. Cut into 1″x1″ squares, poking holes in each cracker to prevent them from puffing. Bake at 350 F for 15-20 minutes, until the edges are starting to brown and the crackers are firm. This looks so simple! Adding it to my to-try list. Thanks! 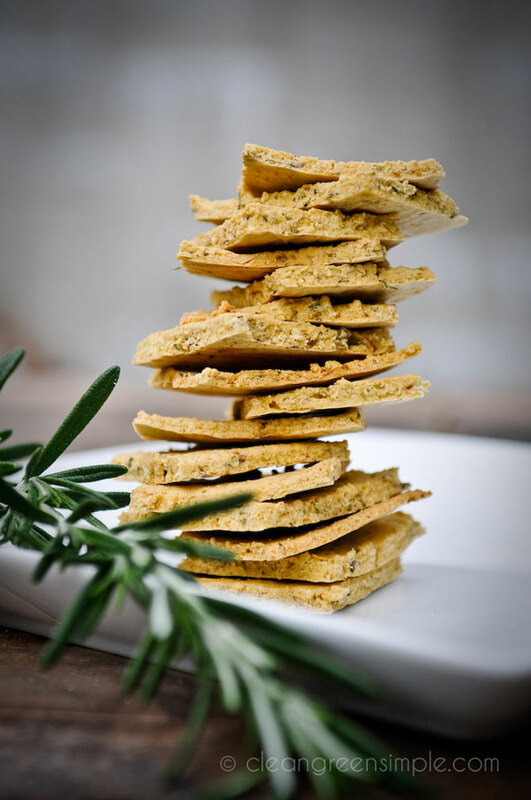 I adore crackers, and I won’t have to feel guilty about indulging with this recipe. Even better, no preservatives like the crackers you purchase at the store. This is just my kind of baking good. Can’t wait to try it. Cheers and thanks for the recipe! What other type of flour can be used for this recipe. ?I am unable to find chickpea flour. I think amaranth flour or sorghum flour would work, can you get either of those? If you’re not gluten free you could of course use whole wheat flour. Oh, brown rice flour might work too. If you try any of those let me know how it works out! I have whole wheat so I will let you know how it goes. Thanks so much! These look wonderful. I love the fact that they’re gluten free–it’s so hard to find real CRUNCHY stuff that’s gluten free. I’m going to try these soon! 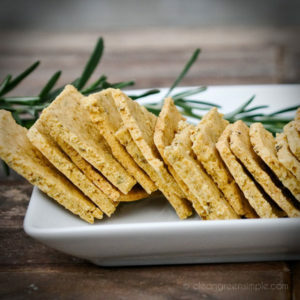 These look fabulous… there is so little FRESH and TASTY in the world of gluten free crackers widely available… question: Why dried hergs? What would happen if you used fresh… too much moisture? I don’t actually know, I’ve only made it with dried – I bet fresh would actually be good, but you would want to be careful not too add too much because of the moisture, as you mentioned. If you make them with fresh herbs definitely let me know how it works out! This looks awesome! I’ll try these crackers with gluten-free flour mix. 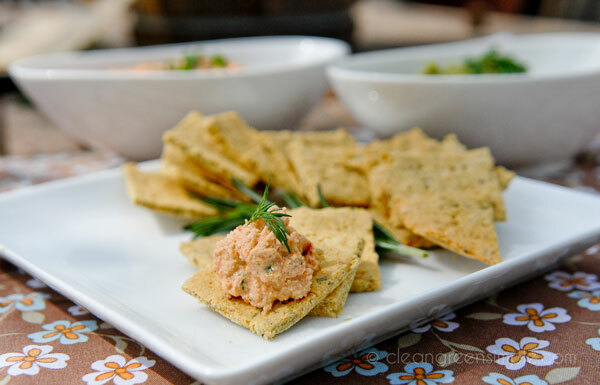 I made these crackers last weekend for a special dinner with friends. They were definitely a hit. I made my chickpea flour with my Vitamix dry container in about 30 seconds. No problems with the recipie – great instructions! These crackers will be a ‘regular’ in our house. Thanks for sharing. YUM! 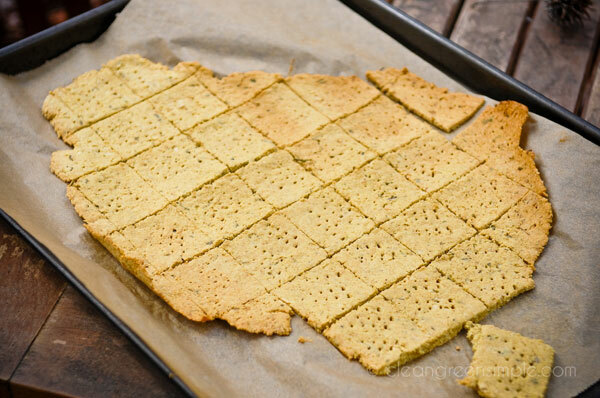 YUM ~ I have never cooked with Chick pea flour, but will try this. I’m looking for a gluten free cracker recipe and allergic to everything. I don’t recommend cooking ground flax seeds, since their delicate oils have been exposed. This is why flax oil is stored in the cooler section of health stores. It oxidizes very quickly with light/heat and becomes toxic to our cells 🙂 ~ thank you for the recipe and beautiful photos! They look like a nice easy recipe to try. Check out our website showing our easy method for making tempeh. We produced Betsy’s Tempeh in Mich. for 9 1/2 years producing a user friendly tempeh that our customers loved. Since retiring, we now make tempeh for ourselves and friends. We recently filed a patent for a tempeh incubator that could be used in restaurants and small shops making artisan tempeh for the local community. Check our website for the latest information on our new invention.